Originally published in 2008 in Caching Now , a former publication of Berntsen International, Inc. Shortly before the end of 2007, we began compiling yearly statistics for our benchmark recoveries. The vast majority of finds came from our far-flung adventures in Arizona and Maine. With such globetrotting tendencies leading us to some of the most scenic benchmark settings in the country, you might think that the marks closest to home (northeastern Pennsylvania) pale in comparison. That’s not really the case. 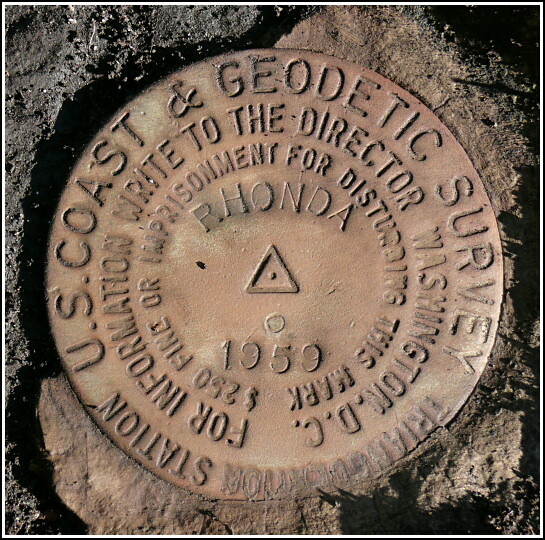 Nearly all survey stations pose exciting challenges of one kind or another, especially triangulation stations! But the ones near us are easier to reach and less scenic than those we find while on vacation, and we can fit them in when we’re looking for just a quick morning hike. Honestly, sometimes we procrastinate, and we procrastinated well with LY2791. So what was our motivation this time? We had carried that datasheet around in Rich’s car since 2003, just waiting for a day when we had nothing better to do. Why did we finally decide to search for the mark now? Becoming acquainted with Rhonda Rushing through our contributions to her book Lasting Impressions had a lot to do with it. We finally knew someone with a namesake tri-station! Of course, as president of Berntsen International, Rhonda can stamp a disk with her name any day she likes; but one in its original setting placed for a particular purpose has to be, we thought, more authentically thrilling. Perhaps she would even enjoy our report and photos so much that she might include them in Lasting Impressions, Volume II , if such a work is forthcoming? Thus finding RHONDA became our goal for the next nice autumn day. When RHONDA was set in 1959, the surrounding area was pasture land. Ten years later, the Wemberly Hills Golf Course was established on the land just to the south of RHONDA’s knoll. It remains a popular course to this day, but our familiarity with the area, as well as prior visits to the golf course, gave us confidence that we could reach the coordinates without difficulty, and probably complete our recovery without incident. Sunday morning was calm and the sun shone brightly—a rarity in northeastern Pennsylvania, even during the typically dry month of October. We parked in the golf course lot, then followed a dirt road toward the small knoll, a slight rise from the level of the road. Our tool bag and backpacks were bulging with the usual long measuring tape, trowels, gloves, probes, garden clippers, flagging tape, GPS and remote antenna, hatchet, folding saw, compass, and camera. I, Zhanna, carried a tripod slung across my shoulder and held the datasheet in my hand. We didn’t need a map for this excursion. The former pasture land in the vicinity of RHONDA is now a weedy meadow, but it is still mostly open and easy enough to walk through. It is bordered on the southwest by open woods and on the north by a high stone wall. We unloaded our equipment in an area free of weeds and began to look around. At first we saw no marks and no rock outcrops matching the description. A quick overview of the area was a complete failure, even though we felt confident in the coordinates. What did this mean? Usually it means we have some digging to do. Probing the ground near the station coordinates, we could tell that a great deal of soft but root-filled soil covered the bedrock beneath. Rich pulled back a heavy mat about four inches thick and we dug and scraped, trying to reach bedrock, but nothing revealed itself to us. Hmm…perhaps this would be a tougher recovery than we had thought. To save ourselves the sweat and frustration of digging an area too large in the wrong place, we decided to search a little harder for the reference marks, hoping that they could be found and would then lead us to the station. After all, that’s their purpose! Eyelevel view of the disk, set into a small boulder underneath the rock wall. Rich and I walked together in the general direction of RM1, having noted that RM2 was most likely near the thickly overgrown stone wall and would be harder to find. We descended a bit, almost imperceptibly, and spotted a large, flat outcropping slab of bedrock. Simultaneously, Rich and I saw the blue-green disk! Using our sighting compass and the “box score” data about the reference marks from RHONDA’s NGS datasheet, we projected an imaginary line from RM1 back toward the station, and Rich paced off the approximate distance. Our long tape is usually handy in these situations, but in this case the arrangement of brush and a tree made it impossible to use. We still saw nothing promising in the vicinity of the mark. We stuck a probe in the ground anyway, to mark our guess at the station’s suspected location. From this estimated point, I used the compass again to direct Rich on the bearing which, according to the box score, should bring him to RM2. It was indeed hiding in the thicket, somewhere near the stone wall. “Gardening”—our term for clearing back brush and weeds—was necessary. Rich hacked and slashed his way through, and eventually spotted the reference mark just a few feet from our bearing line. 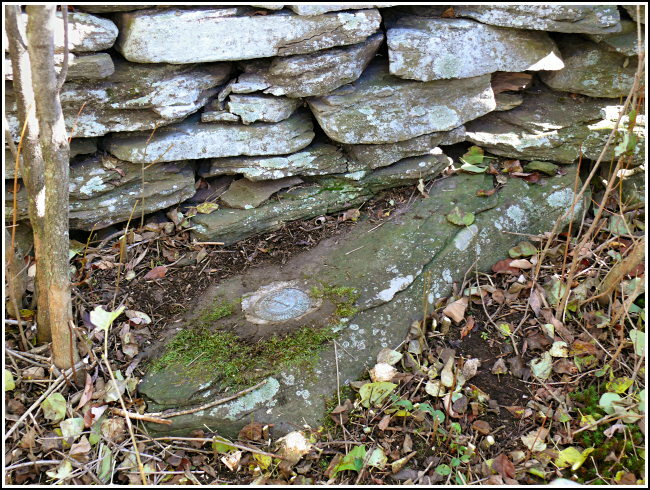 It was set in a rock that was halfway embedded in the ground beneath the stone wall. I fought my way through the remaining brush to stand over it, and I was able to sight a bearing line back toward the station. Rich intersected RM2 with the line we’d taken from RM1, and, combining this knowledge with that which we could deduce from the former placement of a witness post, we were able to pinpoint the station disk. We soon realized that our earlier efforts had very nearly uncovered the disk, but a thin coating of dirt had still somehow obscured it. A closer look and a quick brush with a gloved hand were all it took for RHONDA to emerge! We were thrilled to document our find with photos and to submit the first official NGS recovery of this station in over thirty years. Now, here’s a friendly challenge: there is one more RHONDA (FM1025) to be found near Tucumcari, New Mexico. Perhaps one of our fellow benchmark hunters in the Southwest would like to attempt it? Jennifer Maher works as a computer systems technician and programmer at the University of Scranton, and is also a graduate student in information science at Drexel University. Her primary interests are website development, railroads and trolleys, and local history. Rich Galas is an automation and robotics technician for a major CD/DVD replication company. As avid outdoor enthusiasts, both love hiking, mountain biking, rock climbing, nature photography, cooking (and eating! ), squirrel hunting, and target shooting. 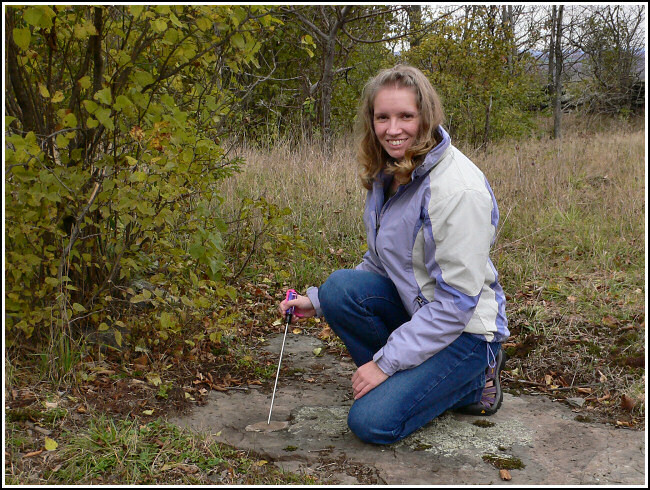 They also enjoy searching for and recovering survey marks for the physical and technical challenges it involves, and because it helps to preserve what they feel is a truly valuable national resource.